Product prices and availability are accurate as of 2019-04-23 22:59:41 BST and are subject to change. Any price and availability information displayed on http://www.amazon.co.uk/ at the time of purchase will apply to the purchase of this product. 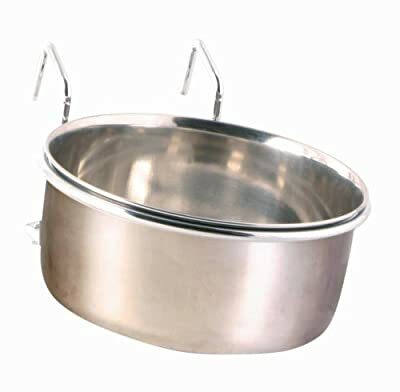 Brand new stainless steel 5" Bowl with hoop attachment to hook onto metal cages or crates stops your dog knocking his water all over his crate as it is kept off the floor. With it's clip over attachment makes it easy to move. Bowl is 5" wide and 2in deep approx holds600 ml/ø 12 cm. These are sold mainly for dogs, but designed for Bird Cages.